As spring finally shifts into the warmth of early summer, many BBQs across North America are being pulled back into the sun and fired up after a long winter break. Unfortunately, many retailers and meat distributors have also started to feel the less-than-pleasant reverberations of the annual lamb shortage. Every year at this time, lamb lovers search for their usual lamb favourites. Retailers scramble to fill lamb displays. Grills remain bare of the lamb classics. Somehow, each year feels worse than the last, and in many ways – it’s not too far from the truth. Globally, lamb supply is shrinking among traditional lamb sources while demand is increasing. New Zealand, the world’s traditional lamb juggernaut, has seen their flock reduce from 46 million sheep in 1998 to 28 million in 2016. In the most recent ten-year period from 2006 to 2016 there has been a 28 percent reduction with a loss of over 5 million breeding ewes. This is a staggering reduction of breeding stock when compared to North America’s current breeding ewe inventory of just 3.5 million ewes. The situation in Australia is no better – sheep numbers have dropped 30 percent since 2006 and total inventory sits at around 46 million sheep. Here at home in North America, the problem is a little more urgent. Not only are we facing an overall reduction in lamb numbers, our domestic markets are changing quickly. The consumer population is growing rapidly in size while simultaneously broadening in ethnic diversity, driving up demand higher than ever. Is there is a solution? Yes. But to understand it, we must take a deeper delve into the nature of the North American lamb industry itself. Why is late spring and early summer particularly challenging for lamb producers in North America? Traditionally, lambs are born in the spring, raised until fall, and sheltered over the winter until they are ready for market. Lamb is typically in peak demand during the Christmas and Easter seasons. By Easter, most of the older flocks that have been kept aside from the previous winter have all gone to market and industry stocks require replenishment. The new lambs are born over the winter on specially designed breeding farms, or in early spring on more traditional farms in warmer locations. A lamb can be up to twelve months of age and after that they are typically classified as mutton. Mutton has far less market demand and value. In comparison to beef cattle that are brought to market between 20 and 30 months of age, it is clearly far more challenging to manage year-round supplies of lamb with traditional farming practices. SunGold Meats, a processing plant that specializes in lamb, feels the pressure from every side especially at this time of year. Some of our retail and foodservice customers are requesting (read: aggressively pleading) for higher output. Our employees have less work and lower pay cheques. Organizationally, reduced supply volumes wreak havoc to already slim bottom lines. In other words: a solution is badly needed. Where others see challenges and large risks, we see opportunity. Not one to back down from a challenge, SunGold Meats is assembling a scalable infrastructure framework to ensure our foodservice and retail consumers will never run out of our products. Five years into executing on our plan we see the light. The upcoming years promise to be exciting and eventful for our business. We are already seeing the benefit to this strategy and are talking to retailers and others to find growth partners, particularly on our value-added program (easy to cook lamb burgers, sausage and meatballs). SunGold Meats is surrounded by vast plains and pasture land, on the northern edge of the agricultural heartland that spans central North America. Over the last several years, we have fully renovated our plant facilities and constructed a state-of-the-art feedlot to bring the best of food safety and quality to our lambs. We are primed and ready for growth. At the same time, Canada Sheep and Lamb Farms (CSLF), which is based on the eastern edge of the prairies, has built the largest, expanding breeding ewe flock in North America. CSLF’s strength has been the refinement of livestock management processes and genetics to produce lambs year-round at scale. This has obvious benefits for the entire lamb industry as the seasonality of the supply curve is smoothed out while other companies are annually experiencing a lamb shortage. Together, SunGold and CSLF have big goals to reshape the lamb industry in both local and international markets. A perennially-consistent lamb supply combined with great, repeatable consumer experiences will grow our business, the business of our retail and foodservice customers, and enrich the North American lamb market. There is still much work to do, but at long last, we have cracked the code to achieving an audacious dream. About two million years ago, prehistoric humans were as unimpressive as any other wandering land mammal. In fact, our particular species, the Homo sapiens, didn’t even make it to the top of the food chain until about 100,000 years ago – a very recent date with respect to the evolutionary timeline. The ability to control fire was a pivotal point for human development. It provided warmth and protection, allowed weapons and tools to be shaped, and enabled our hominids (any of the species in the Homo range) to start cooking food. Prior to the advent of fire, the human diet was primarily made up of easily digestible plants, seeds, flowers, and fleshy fruits. Plant stems and roots still couldn’t be incorporated because the raw cellulose and insoluble fibres were indigestible. Raw meat was hard to chew, hard to digest, and was often full of parasites. Once the early humans figured out how to cook their food over fire, a large variety of dietary options opened up. It quickly became evident that cooked meat was a great source of nutrients and caloric energy, and it naturally became a dietary staple. As the amount of energy they absorbed from their food increased, so too did the survival and reproductive rates of humans. We became stronger, faster, and more prevalent on the earth. In fact, as the human diet changed, the human body also adapted physically. Teeth that were big and flat (for grinding raw leaves) eventually became narrower and sharper (better for cutting into cooked meat and vegetables), resulting in the much smaller jaw size you see on our own faces today. It’s also likely the increased caloric energy that came from eating meat allowed human brains to grow in size quickly – giving them a competitive advantage over other large mammals that existed at the time. The big-brain advantage also ended up being the selective feature that allowed Homo sapiens (our species!) to out-compete other species in our genus like H. erectus, and spread all over the world to create our own nomadic communities. Sheep were the first animals to be domesticated as a food source by humans, dating back as far as 9,000 BC in the ‘Cradle of Civilization’ (current day: Iraq, Kuwait, Turkey and Syria). But before they were domesticated, they wandered the fields in a larger, wilder form called mouflon. The nomadic human groups that first hunted wild mouflon gradually changed the composition of the herds on which they preyed. Humans found out that it was to their advantage to only hunt adult rams and old or sick sheep, sparing fertile females and young lambs in order to preserve the long-term vitality of the herd. 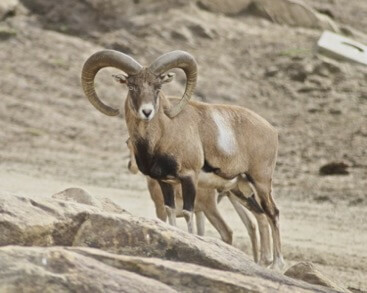 Then, as the mouflon became a more established part of their diets, humans started actively trying to protect their new food source from wild beasts (and other hunting groups). Over time with selective hunting and protection, the wild sheep herds became more docile, more fat, and more wooly – much like the sheep we see today. Eventually, however, it would just start making more sense to corral the sheep in an enclosed space for easier access. Why? Well, there were some other factors involved as well. About 14,000 years ago, as humans started discovering the power of domesticating plants, they began to settle in large groups near bodies of freshwater and fertile land. The Agricultural Revolution (otherwise known as the Neolithic Revolution) started spontaneously happening in different places around the world. Over the next millennium, the agricultural revolution would dramatically transform nomadic groups into sedentary societies that would grow into villages and towns. Humans began to selectively breed cereal grasses like barley and wheat, spending the vast amount of their days growing, watering, and taking care of their crops. However, because meat was still such an important part of their diet, people had to find a better (and faster) way to access it; day-long hunts were no longer an option. Ergo, the sheep pen was developed. Herding and housing all the sheep in an enclosed space at the center of the village was an efficient way of protecting and maintaining villagers’ main source of meat. There is established archaeological proof that proves the domestication of sheep in early Mesopotamian civilizations from over 10,000 years ago – ranging from bone specimens to dung remains in places where sheep were corralled together. Other than being a delicious (and nutritious) addition to a diet, the secondary advantages of sheep domestication became even more clear as time passed. Sheep provided dung for crop manure, bone for the creation of needles and arrows, fat for tallow candles, milk for dairy consumption, and wool for clothing. In fact, sheep became such an invaluable part of daily living that they were soon traded all over Europe and eventually, to all four corners of the earth. Today, sheep farms exist all over the world – even here in Canada! Want to test out the original grill meat and try your hand at some lamb-centered culinary masterpieces? 10,000 years of history thinks you should! SunGold Specialty Meats is a federally inspected, HACCP-certified, full-service lamb and goat processing plant located in Innisfail, Alberta, Canada. Operating since 1974, SunGold is proud to work very closely with some outstanding western lamb producers to bring our customers top quality, grain-finished lamb products. Find out more about our story here and get started on your next food adventure!